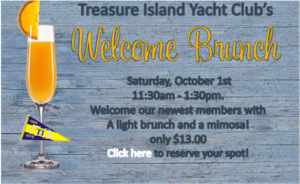 Treasure Island YC is hosting a Welcome Brunch on Saturday, October 1st from 11:30am to 1:30pm to welcome our newest members. Come join us for a light brunch and mimosa. Cost only $13.00 per person. The Treasure Island Yacht Club’s foundation is its members. We are made up of young families, retired couples and singles. 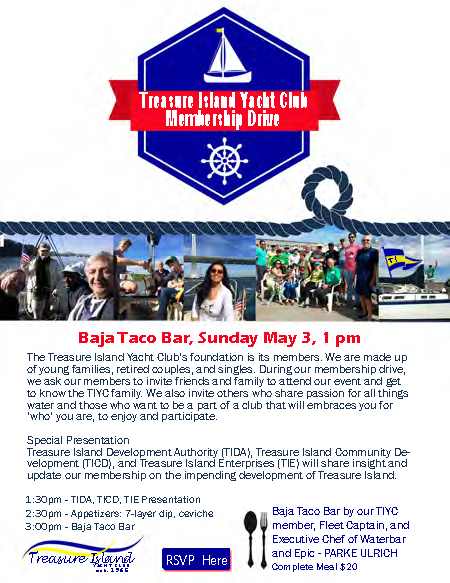 During our membership drive we ask our members to invite friends and family to attend our event and get to know the TIYC family. We also invite others who share our passion for all things water and those who want to be a part of a club that will embrace you for ‘who’ you are, to enjoy and participate. 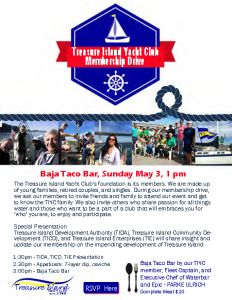 Treasure Island Development Authority (TIDA), Treasure Island Community Development (TICD), and Treasure Island Enterprises (TIE) will share insight and update our membership on the impending development of Treasure Island. Please mark your calendar for March 7th. It’s both a house work-day and New Member Appreciation Dinner. I’ve heard that the work day will be an easy one: a bit of Dinghy work, and Inventory of Everything. Surely we’ll be discussing the big move slated for later this year. For dinner, we’ll start a bit early, because everyone will be famished after a long day’s work. Snacks and Cocktails at 4pm, Dinner at 5:30. Menu will be prepared by our own world-famous Executive Chef, Parke Ulrich with the help of our Membership Chair and Rear Commodore MeeSun Boice, who both promise a fabulous Moroccan inspired feast. We’ll include more info about the menu soon, but chicken, fish, and veggie choices are likely. 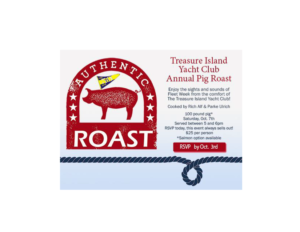 Strict limit of 40 seats maximum, so please RSVP to me by clicking on this LINK or call 510-589-7410. Even with the seat limit, if you have a prospective member or two, let us know, and we’ll make room. Closing and securing the club. 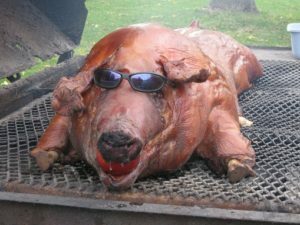 Come join us and stay for the Super Bowl party which starts at 3:00 pm. Kickoff is at 3:30 pm. Steve & Carol Lane are Regular Members. Their boat is a Columbia 10.7, “Seredipity,” located in Emeryville.